Usage & Type : BF-3, for automobile brakes and clutch. Ingredients: Polyalkylene Glycol ethers (99%) and anti rust agents. Direction for use : While changing or replacing the brake fluid, use recommended brake fluid only. Maintain brake fluid levelk between max. & min. levels in reserve tank. Do not mix with any other brands, otherwise braking sy stem may become ineffective. 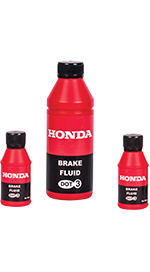 Keep brake fluid container clean and dry. Contamination with water, petroleum products or other materials may result in brake failure. Warning : Highly inflammable. Being a hygroscopic fluid, if diluted, its vapourlock will increase and boiling will decrease which will make braking ineffective. Avoid spilling brake fluid on braking lining and car paint. Features : Honda Ultra radiator liquid contains a special additive with high purity ethylene glycol as the main ingredient for superior durability. It can be used as an all season product to prevent freezing in winter and promote cooling in summer. Attention : Honda ultra Radiator Liquid is premixed with DI/DM water and factory prepared to the Honda recommended concentration. Do not dilute further with water or any other liquid. Directions : Remove the radiator liquid now being used and clean the radiator interior. 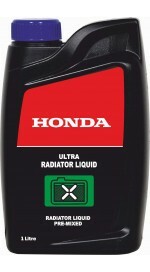 Install Honda Radiator liquid directly into radiator till pour into expansion bottle till between the marks. A relatively new and convenient concept used worldwide. Factory prepared Pre-mixed coolant takes away the disadvantages of mixing concentrate coolant with normal water. Normal water is generally hard and full of corrosive chemicals which lead to drop in cooling efficiency and coolant life. Caution : If the radiator liquid level becomes low during driving, the engines cooling properties will decline. If the level becomes low, replenish the Honda Radiator Liquid (pre-mixed). 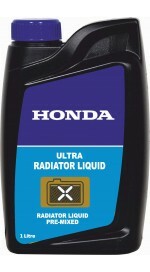 Honda Ultra radiator Liquid contains a special additive. Do not mix with other brands. When the cooling temperature is high, opening the radiator cap could cause steam and hot water to come out. Be especially careful to avoid burns.